The 2010 results show a FAIL for Israeli Companies with average transparency at 33% , despite a slight increase over 2009 (31%). Corporate Responsibility and sustainability are not a valid proposition without transparency, we believe, and therefore we see great importance in tracking the transparency levels of Companies. Of course, this Index does not say anything aboutthe QUALITY of the Company's sustainability performance, though we believe that there is a definite correlation between transparency and performance improvement over time. For all the details including which Companies are in the lead, and which lag far behind, for the detailed placement of all the 100 Companies in the list, and for analysis and interpretation of the results, download the full report. To see how the Jerusalem Post reported on this - take a look here. Happy to hear what you think. What's the transparency of top Companies in YOUR Market or sector ? And to round it all up, the CorporateRegister.com CRRA '10 Awards Brochure on Global Reporting Trends and details sof the 2010 Awards Winners and almost winners is now available for download. You can read about how the winners won, and the overall state of global sustainability reporting from one of the most authoritative sources there is. Couple of highlights ? OK, you persuaded me. About one-fifth of all reports in any given year are first reports. CSR reports and Sustainability reports are by far the most dominant - about 70% - with a small percentage of reports covering single subjects. (According to CorporateRegister.com, a sustainability report is a CSR report which includes economic information). About 5% of reports are "integrated" reports - less than 200 in 2009, and only a slight increase versus 2008. Of all the votes received, some were invalid, leaving 6,981 valid votes. Of these votes, Eurpoeans were the main voters, followed by Americans and Asians. Corporate CSR professionals were the main voters, followed by people in service organisations, whoever they are, with CSR consultants and students making up the next biggest groups of voters. Academics, investors, journalists, NGO's and regulators made up the remaining 17% or so of the votes. The report on How the winners won is interesting and gives, as in previous years, the top ten reports in each category and an analysis of scores, characteristics of the winning reports, and which voter groups voted. Couple of highlights ? Nope. I've done enough. Go look for yourself! Softchoice - the different CSR report. Really! Softchoice issued a "new style" CSR report. (which I picked up via Google Alert and a CSRWire.com press release). Well, how many times have you heard that "new-style" thing before ? New, different, groundbreaking, unique, remarkable... how many Companies think they have produced something absolutely original when really its same sort of stuff with a picture of a different kid on the cover, or a few extra links, or an e-book which takes till 2050 to download ? STOP. Softchoice has really done it ! Their report is really "new style" . It's really different from the pack. A creative and engaging approach to reporting ! Learn from our pitfalls - for example, make sure you consult with people in the business before shutting off their computer automatically to save power. Some people might have different needs. Low-hanging fruit - for example, make sure you know what your electronics recycler is doing with your assets. Some of the tips are modestly self-serving for example, a You can do it! tip includes "When you place your next hardware order with Softchoice, make sure you ask for the consolidated shipment option" ! But, what the heck, they deserve a few extra orders for sheer creativity! The report is delightlfully full of the people who make CSR at Softchoice, even including a 4 year old bulldog who accompanies "Mom and Dad" to the office and a host of photos and vids of the Softchoice people. The Report itself is a GRI C level, and reasonably comprehensive, and for a mid-sized business with under 1,000 employees, its a major achievement. Their first report was pretty good, too! Thumbs up to Softchoice! You can see they had a lot of fun writing this report! 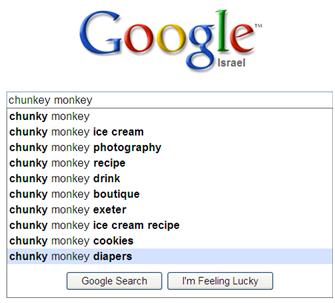 I bet they like Chunky Monkey as well. Got a DM from Ashley Jablow, brilliant #CSR blogger at the www.thechangebase.com who referred me to the new Starbucks online CSR Report and says: "Thought of you when I saw SBUX new CSR report online - curious to get your take as a reporting pro?! " (Hope you don't mind me publicizing your DM, Ashley!). Anyone who knows me, knows I am a sucker for reporting questions, so I took a look at the report. The first thing that stikes you as you land on the home page are the 13 little icons that display the Goals and Status in all the key areas of the Starbucks sustainability program. These are not just ordinary icons. They are aminated icons. As you plop your cursor on each one, the icon does its thing, wiggles around, changes size, the wind-turbine rotates, the recyclable cup squashes into a ball of waste, the trees move with the wind, the sun shines, the building lights up, the fairtade coffee beans jump from hand to hand and more. It's really neat. I thought to myself, What better way to get people to click through ALL the icons, just to see what they are going to do, and in the process, learn about the way Starbucks has progressed in its CSR goals? Most of us are kids at heart, right? Clicking though animated icons is like a kids game. It a neat way to make CSR communications fun. The rest of the report is nicely put together, taking advantage of many of the online pyrotechnics that are available today. As you double-click on each goal area, you get to a page describing the progress towards the goals in more detail and a further click brings you to the story and how Starbucks have done what they did. Nice design, compact, engaging presentation. However. If I stop rolling my cursor around the fascination of the jumping icons, I find some elements that I would expect to see in a sustainability report are missing. For example, whilst Startbuck maintain several collaborative relationships, which is a sign of a mature approach to business and sustainability, there is no dancing icon for stakeholder engagement and description of stakeholder dialogues and feedback to Starbucks about concerns and aspirations. Although Starbuck's talk about engaging millions of consumers and getting their feedback, linking to the new Shared Values blog, there is only actually one post by a Starbucks Marketing Manager and no feedback from any consumers to date. Interestingly, there is no flip-flop icon which points to the way Starbucks addresses its responsibilites as a responsible employer, creating a responsible workplace. Nothing at all relating to workplace practices and employee engagement. Achievements against goals in the downloadable scorecard are impressive, but it's not clear what Starbucks are committing to in the future - some targets run thru to 2015, some to 2012 and some stop in 2009. What's on the menu for 2010/2011 ? 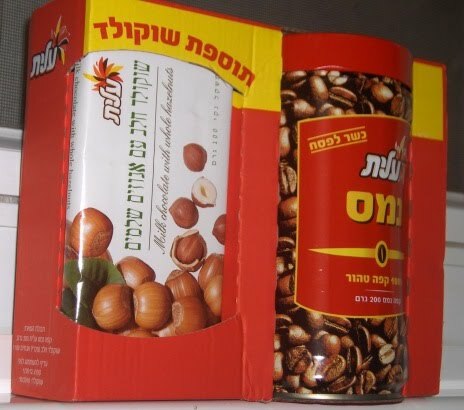 The assurance statement covers only coffee purchasing practices.What about milk ? And other raw materials? I couldnt find data about Starbucks overall environmental footprint, and the entire scope of retail practices in the Starbucks business are not covered. So, this is a very partial report, focusing only on a limited number of Starbucks sustainability elements, but doing so in a very engaging way. I will add that from my perspective as an external stakeholder who tracks sustainability practices and reporting, I do feel that Starbucks are doing good stuff. Their three overarching focus areas of ethical sourcing, community involvement and environmental stewardship are important and Starbucks is making focussed progress and doing some really exciting things, such as the Farmer Loans program. However. sustainability reporting and transparency should be more comprehensive. Starbucks has had its share of criticsms leveled at its retail practices, supply chain issues, union busting, wasting water in stores, low wages, etc and it would be of interest to see how this Company is behaving in all areas of impact, not only the ones it has, apparently unilaterally, selected, significant as these may be. Anyway, off to try a Chunky Monkey macchiato, now. Suggest you stop playing around with those icons and do the same! Thanks Ashley, for providing me with the inspiration for this blop. Who didn't win the CRRA 10 awards? Following previous posts on the Winners of CRRA '10 and insights on CSRWire and VODAFONE and 888 Holdings, and after congratulating the worthy winners, I thought it might be worth taking a look at the ones who didn’t win. I have picked one entry in each of the nine categories which in my view deserves a mention. I left out reports which were voted in one of the top 5 places in each category. I think I will call this the Chunky Monkey Alternative Reporting Awards. CMARA for short. hahahaha. 46 pages, GRI B level, GRI checked, not assured. Corporate Express is a leading supplier in Australia of business supplies and IT solutions. The report is clear, nicely but not overly designed, well but not simply written with no pithy CSR-speak fillers, constructed in a format which I find appealing – the four areas of impact – marketplace, workplace, environment and community – with clear targets for all sections and evidence of deep consideration in the management of sustainability. Watch out for their next report in coming up in September 2010. Spring Romance Properties 34 (Pty) Ltd, Sustainability Report 2008, Impahla Clothing. 37 pages, GRI B+ level, third party checked. This Company has a great name and a great history. With a cover stating Impahla to be "SA's first carbon neutral garment manufacturer" and showing thumbnails of Impahla clothing's employees, who are photographed all the way through this report, Impahla shows SME's how it's done. Impahla is a supplier of the sportswear leader PUMA, and participated in 2006/7 in a project to drive CSR reporting through the supply chain, led by the GRI in partnership with leading multinationals. Impahla is a privately owned African Company with just under 90 employees, of which 87% are female and 97% are non-white, manufacturing a mere 176,000 garments per year. 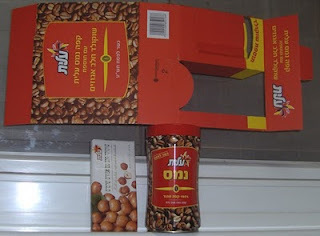 They started exporting only in2008, and are realizing impressive growth. Their learnings from embedding sustainability processes and reporting are worth reading. Concrete examples quoted are increase in sales by 15.8% and reduction in electricity consumption by 40% per garment. This second report is a delightful, highly readable, professional and informative model for SME's everywhere covering high level material issues such as the use of technology through to day-to-day developments including team achievements such as "Appointment and training of Joyce as our first Shop Floor Safety Officer". Read it! CEBU Holdings is a real estate and property development Company in the Philippines and this is their second Integrated Annual Report. I make no secret of my reservations about integrated reporting, and the challenge of combining financials and non-financials in one report in a way which adds value over separate reports, however, CEBU make as respectable job of this as one can expect, with a GRI Level B report. The report is nicely designed with wonderful photography. Whilst pages 85 through 135 are financial statements, irrelevant for the sustainability professional, the sustainability section is strong, clear and demonstrates a systematic and logical approach to CSR. Their list of stakeholders and engagement processes is the longest I have ever seen, and stakeholder commentaries are a nice addition. Amcor is a packaging Company based in Australia, and this 50 page, GRI B+ report is straightforward and systematic, identifying the key sustainability challenges for the Company and reporting in detail on what Amcor is trying to achieve and how they are going about it. Carbon disclosure is well covered with details of emissions by operating location as well as an extensive environmental section. This 91 page, seventh CSR report from WPP Group is nothing if not creative! The designs is incredibly fun! The report is not only design, however, and includes serious and professional content about WPP's approach and programs in all relevant CSR and sustainability areas. Several case studies from P&G, Unilever, Timberland and more provide evidence of the WWP CSR approach in action and the report includes a pro-bono showcase which I am sure must be the pride of the Company. I have always been a fan of this Canadian paper manufacturer's reporting, and this 6th report under the heading of "Decisive action in changing times" is another great effort. It's a 40 page GRI C report, focusing strongly on the impacts of the financial crisis and the need for decisive action which included closing a paper mill and issues of profitability as a basis for sustainability, reversing the modest losses of 2008. A good report by a company committed to sustainable business. This a pharma and life sciences Company based in Uttar Pradesh in India, owned 50% by the founders with the remaining shares held by fincnaial organizations and the public. The Company has been reporting on sustainability for years and this report is a good example of a non-nonsense approach to reporting. Key material issues have been identified, including, for example, the shape of expoxy putty (who could have guessed?!) and the report presents a good selection of data in its 61 pages, confirming with GRI A+ level. It's a little wordy, but presents a good picture. This is a nice report which goes straight into the discussion of the Company's most relevant issues, including 5 top issues from employees and top issues from customers and investors. It's a 42 page GRI B+ level report, assured by Det Norske Veritas who generally produces good statements. This one is a little short, and lacks recommendations for the future, but a nice touch is a case study of the DNV team in verification of the China office and other places. The inclusion of the verification process in the body of the report rather than only as an isolated statement at the end is an innovative idea, and adds to understanding and credibility of the assurance process. Partly due to my weakness for first time reports, and partly because this is a nice report, and partly because I left this to the last, and I have already picked most of the other reports I would be prepared to give a non-winners award to, I selected CASCADES Inc. This is a paper and packaging Company based in Canada, employing 13,000 people in the USA and in Europe. Their report, which is a 60 page first timer, following the GRI at an undeclared level but containing a full GRI index, is brilliantly creative in its design, rather off-beat, not easy to engage with, actually, with a mix of bold statements filling one page each, strong visuals and very detailed pages with relevant content. However they get their message across, for example, in a plea for greater recycling, the backbone of their business, they ask "As citizens of this planet, who are we to throw out 50% of our potential raw materials? ". It's a report worth taking a look at, if only to learn more about the creative ways a Company can deal with environmental impacts, and how to make an impact with your reporting style. The above is a collection of great reports and great reporters, well worthy of the Chunky Monkey Alternative Reporting Awards. Each one, produced with care and commitment, and many with great skill. Each one, the baby of someone. As I read through all these reports, I can't help but wonder why there is such a great outcry against the Sustainability Reporting movement. These reports are filled with such insights, such fascinating stories of people, businesses, communities and in some cases, wonderfully expressive pictures. You may call me obsessive, and I have been called worse, but I love these reports and believe they serve great value. One thing: Give reporters your feedback because as good as they are, they can all be better. 888 Holdings plc is a leading global responsible online gaming Company, who produced their first CSR report entitled People Planet Play in 2009. This report took third place in the CRRA '10 Reporting Awards hosted by CorporateRegister.com, in the category Best First Time report. Alongside other imperssive first timers such as the Walt Disney Company,(whose report won first place) and Brasil Foods (who won second place) , and Corporate Express Australia, and Jumeirah Group of Dubai, and more, the 888 report was voted into third place by the CorporateRegister mutli-sector stakeholder public. Founded in 1997, 888 Holdings plc is a great Company, with revenues of over $260 million, and employing over 1,000 people at its operational bases in Gibraltar, Israel and Antigua. They operate in line with all the relevant codes of practice governing online gaming and are a founding member of eCOGRA, the independent standards authority governing online gaming standards, regularly winning awards for their advanced responsible practices. The Company participates in the United Nations Global Compact and their first report served also as their first Communication on Progress. As an online gambling business, responsible gaming is at the core of their considerations and after many hours with the Corporate Responsibility and Responsible Gaming Director, Ruth Tanami, and other people within the Company, including the Human Resources team who do a great job of creating a culture in which values are always top-of-mind, I can testify to the fact that responsible gaming, and other aspects of leading a responsible business are at the heart of business decisions and in the consciousness of the Management. The Company has a dedicated responsible gaming website, which includes a self-assement for people with difficulties in managing the way they play, and advice and tools for all those who want to know how to enjoy the game without getting into hot water. The first CSR Report for 888 is a 90 page, GRI A Level, GRI checked report and includes a Materiality Analysis which, not surprisingly, includes responsible gaming and prevention of youth gambling as core to the sucess of their business and high in the minds of stakeholders. One of the most successful community initiatives of 888.com is the Annual Charity Day in which the online gaming community is encouraged to select a charity to which the 888.com site donates. This raised awareness and cash (the Day raised $100,000 in 2008), and has been continued in subsequent years. Congratulations to 888 for a great approach to reponsible business in an industry which contains inherent risks, and for the determination and professionalism in delivering a first CSR Report. It is always a pleasure to see clients gain recognition for good work! A TRIBUTE TO VODAFONE !!! Vodafone has won Best Report in the CorporateRegister.com CRRA '10 Reporting Awards for the third consecutive year. Since 2004, Vodafone has been using their signature format "We have, We Said, We Will", is a powerful approach which stands the test of time and clearly attracts and interests stakeholders. In this post, I pay a tribute to Vodafone for maintaining leadership in sustainability, transparency and world class reporting. Anyone who has ever read a Vodafone report , or even part of one, will know, as I do, that they really do produce exceptional reports, both on a global level and in many individual locations - – you can check out Vodafone Australia , or Vodafone Albania, or many others. Vodafone locals produced 11 reports in fiscal year 2008/2009. These are not just translations of the global report. They are genuine reporting efforts tailored to the needs of local stakeholders. Not only are their reports designed with clarity and flair, the Vodafone online Corporate Responsibility site is a pleasure to navigate. Year Ending March 2007 – CRRA '07 , Best Report, 9th place in Best Relevance and Materiality, 7th place in Best Openness and Honesty, GRI Readers Choice Awards 2008, Honorable Mention. Vodafone Malta Corporate Responsibility Report as at 31 March 2006 - CRRA '07, 4th place in Best First Time Report category. The Vodafone Report for the year ended March 2009 won by a clear margin of around 100 votes. (I think one of them was mine!) This is their ninth annual Corporate Responsibility Report and is called "Mobilising Development", which, if you think about it, is a nice play on words. The report is an interactive PDF with a tabbed page navigation system, and icon hyperlinks within the report which makes navigating the PDF a dream. Other links also lead to the web pages. The issues are stated up front and the stakeholder engagement discussion is nicely detailed . There is even a list of issues raised by investors, with climate change and Base of Pyramid Initiatives being top of the list by a long margin, and a clear Materiality Matrix, something which only the best of reporters include. Increasing access to communications is Vodafone's top material issue representing both a significant business opportunity and a source of socio-economic value. This is described in Vodafone's now almost trademarked way, and the "we said have and will" sections accordingly completed. One example here is the commitment to offer a phone option for the visually impaired, hearing impaired and elderly customers in every market that Vodafone operates in by March 2011. The nice addition in this report, in response to stakeholder feedback, is the inclusion of an entire section on Vodafone's new Indian business. The assurance statement is well detailed and does a good job. I think the thing that most stands out about Vodafone's reporting style is that the language is crisp, relevant and lacks frills. Vodafone says what they mean to say. They don’t waste lines of their report with generic platitudes, but every sentence packs a punch. It's only 60 pages, but each one counts. Quotes from experts, and their photos add a measure of colour and credibility to the report. All in all, I concur with the masses of Corporate Register voters that Vodafone's report is outstanding and a model for many Companies. Clearly, reporting is a reflection of the business, and it does seem that reporting at Vodafone reflects a core approach of sustainability, which is present in all business decisions. The only question remains, which is, can Vodafone maintain this quality and leadership in reporting? CRRA 2011 will reveal all! The winners of the third annual online CRRA reporting awards hosted by CorporateRegister.com. In this post I will content myself with listing the winning reports. Just so you know. Over the next few days and maybe even weeks... haha.... I will bring you more detailed insights about the awards, the process, the significance, the trends and the reports that won and the reports that didn't win. Yes, even amongst the non winners there are some real gems. CRRA Reporting Awards, the only global online awards for CSR and Sustainability Reports, attracted over 8,000 votes in 2010 (40% more than last year) and provides a reliable window on reporting trends and best practice. and a special word of admiration and thanks to Paul Scott, Managing Director of CorporateRegister.com who created these awards three years ago and maintains an absolutely critical finger on the pulse of sustainability reporting. Great work, Paul! Every so often, I come across absolutely wasteful packaging. Here is another example from my own market. I challenge you to find similar examples from your market. See all that cardboard ? What a waste? Consider the design costs, printing costs and inks, the additional bulk in shipment of this product, the pallets, the handling, the additional space on the supermarket shelf. I would even go as far as to suggest that by taking all that extra cost out of the supply chain, they could probably give two bars of chocolate away for free. How will the consumer dispose of that corrugated cardboard ? Straight to the household garbage bin, and off to landfill with the weekly garbage collection. How much extra cost is in that process given the hundreds of thousands of units this manufacturer will sell, I assume? How many unnessary tons of waste ? I am not an engineer, nor a marketeer, but it bothers me when I see such uncalled for waste in our system. Climate change or otherwise, it's just thoughtless abuse of our environment. I am sure the Company involved is not intentionally behaving irresponsibly. In fact, this company, the Strauss Group, is one of the leading and most respectable Israeli-based global food Companies, practising corporate social responsibility, accountability and transparency. The Company has issued two high-quality Sustainability Reports and is a model for our market. The Packaging Development Manager quoted in the 2008 report , Environment Section, states that impact on the environment is a "paramount value and critical factor" in their approach to design. So, what went wrong ? Once again, I point to the massive challenge of truly embedding sustainability in the business, and ensuring all employees are active in influencing process for improved sustainability, however small they may be, at every stage in every process. How come it takes me, albeit an aware and conscious consumer, to notice this? How come the hundreds of employees involved in the design, manufacture, delivery and shipping of this product don't come up with a more environmentally friendly alternative, before it hits the shelves ? Someone within the system needs to speak up. Instead, in examples like these, we can only assume silent complicity or total lack of awareness on the part of everyone who designs, authorizes, handles and delivers this product. One for all and all for one ? This week CSRWire published my editorial on the subject of integrated reporting. You can read it here. Thanks CSRWire! Integrated reporting is a very interesting subject and one which usually polarizes opinions of experts. The book "One Report" by Eccles and Krzus, which inspired me to write, is a strrong advocate for integrated reporting and even suggests that every company, public or private, everywhere, should be bound by legislation to produce an integrated financial and non-financial report. The authors' recommendations do not stretch as far as to suggest what level of detail of non-financial content should be published in these reports, and this is open for debate, but they do attempt to present what they call a "compelling case". Except that I personally do not find it all that compelling. My piece in CSRWire explains why. That's it. Short and sweet. Well, short. Today I had the pleasure and privilege to attend an event hosted by Microsoft R&D in Israel. 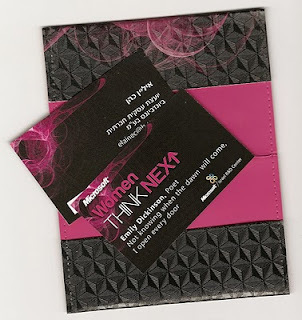 The event was entitled Women Think Next and it was organised in the best of taste, for a primarily female audience, to raise awareness for issues of women advancement in hi tech and to encourage networking which, as everyone knows, women are not good at. All guests were presented with personalised networking business cards and were asked to make it an objective to exchange them with other women, in the true spirit of networking. I cheated! I saved a couple to show you in the photo below. (You can see my name written in Hebrew on the upper card). The event opened with a showcase video of a selection of Microsoft women, including one whose job was "Developer and Platform Evangelism" (what on earth is that ?) and another wearing a T-shirt on which was written "I'm not slacking off, my code's compiling". All these Microsoft women described how they enjoy life at Microsoft, friendship, networking, flexible work arrangements and advancing in their career. It can be done, apparently. Of the range of impressive speakers at this morning event, two made a strong impression. Be demanding: asking for what you want is much rarer among women than it is among men. Push for what is important to you. Perserverence: Dont quit when you are stuck. First get unstuck! Own your own development: No one else will own your development as you do. Display curiosity. Men have problems giving critical feedback to women. Don't rely on others to tell you what you need. Confidence: If you don't have it, pretend you have. Don't share all your anxieties when presented with a new challenge. Accept and give the impression that you are confident. Grow to be comfortable with yourself and who you are in your role. Men have the opposite problem - they are usually over confident! Leadership is a matter of choice, not chance. Dina also shared her thoughts about how CEO's need to change, and I was gratified to hear her stress the importance for CEO's of creating sustainable value, thinking long-term, creating cross-sector partnerships and practising an approach of Think Global Act Local rather than just paying lip-service to this way of running businesses. The above advice was delivered with the assertiveness of a women who has experienced the challenge of working her way up, and succeeding, in a male dominated environment, and with the charm and personal anecdotes of one who clearly holds much influence. Women like Dina help to give us confidence that our global corporations consider their responsiblility and accountability to stakeholders. This event was a pleasant few hours in the midst of our crazy-busy lives, to sit back, reflect a little, learn a little and enjoy the company of old and new friends. A great initiative by Microsoft and one which aligns with their efforts in corporate citizenship. Wonder if it will get a mention in their next CSR Report ? Just as I was thinking about my next blop (blog post for the uninitiated), up popped a fantastic question from my Twitter friend @Juliengoy. He asks: Do you think its relevant to write a CSR report for an event ? Now isn't that an interesting concept ? Of course, asking me, a committed reporter (there are some that agree that I should be committed. Make of that what you will), is quite rhetorical. Of course, it is relevant to write CSR reports for events. You have all heard of BS8901, the British Standard for Sustainable Events, updated in September 2009 which covers financial, environmental and social risks involved with events of all kinds. The London Olympics in 2012 will be a sustainable event according to the guidelines established by London 2012. There are many web resources that assist in the planning of sustainable events, such as EventSustainability.com and the Sustainable Events Planner. The Virgin London Marathon published a Sustainability Report for their event in 2009 and the European Offshore Wind 2009 Conference and Exhibition published a Sustainability Assessment Report of their event. You can even find a brilliant presentation on the subject of sustainable events on Slideshare posted by Michael Luehrs, and if you are quick you can just catch the Third Annual Sustainable Events Summit in London on 19th april 2010. All of the above should be unrefutable proof that sustainability events are an event, and that reporting of sustainability events is a necessary element of such events. I will even suggest that we are seeing a new reporting trend emerging . However, in thinking about this a little further, I realise that I haven't noticed anything out there that represents a standard for CSR reporting of such events. Clearly, the entire GRI Framework is a little top-heavy for a single event and wasn't designed for this purpose. What would the performance indicators for an event look like in CSR language? What would be the material issues? Which metrics ? Which core disclosures? This is quite an interesting subject and if I have time, I might be tempted to hold an event just to to discuss how we would report it. And you can bet that with any event that I organize, a core sustainability metric would be the amount of free Chunky Monkey available to all stakeholders. Julien, mon ami, does that answer your question ? Yesterday I attended a Global Reporting Initiative webex presentation and discussion led by Sean Gilbert on the state of CSR and CSR reporting in China. It was quite fascinating to hear of some of the different perspectives, trends and challenges facing the development of accountability and transparency in the Chinese corporate world and I will share some of Sean's insights here. Sean Gilbert is an experienced team member of the GRI and now serves as the China Focal Point, to assist the development of reporting processes in that country. The sheer size, impact and current state of development makes China a fascinating country full of both risk and opportunity in CSR terms. Over 200 million people in China are still living on $1.25 per day, and China is the second largest emitter of GHG gases in the world. Sean talks of an explosion of interest in CSR and Sustainability driven by the Chinese government as a policy initiative to embrace transparency via CSR and greater accessibility of public information. This is being done with policies to promote CSR in business, and in recent years the perception has changed from businesses as a platform for economic growth and job creation, to organizations which must display considerations of their role in society and the environment. This is just as much about the Chinese government leading the rewriting of the social contract of business with society as it is about displaying responsible behaviours and aligning with sustainability trends. Much of business in China is done via Chinese state-owned businesses and the Government is committed to these businesses reporting on sustainability, developing a CSR department and implementing CSR by 2012. Sustainability reporting is developing rapidly in China, with around 700 reports produced in 2009, from around zero in 2005. The quality of Chinese reporting varies, and tends to be more qualitative than quantitative at this stage, partly because Companies do not have the systems in place to monitor and measure, and partly becaue there is a low level of comfort with a high level of detailed disclosure. Reporting tends to be more focused on the role and responsibility of the business in society rather than specific sustainability impacts. Sean spoke of Chinese Companies using reporting not so much as an external disclusore tool and communications function , but more as a management practice which enables the development of good management processes in the business and more systematic benchmarking of performance. One of the key benefits, though , of the development of reporting is that it offers, perhaps for the first time, an opportunity to engage - reporting creates use of a common language and common framework for relating to CSR issues and the development of consistent policies. However, the transition to a participatory culture will not be easy, and long-term success will depend on building a strong local audience and increasing levels of trust at local level. The GRI will have a functioning full-time office open within the next 6 weeks in China, and hopes to focus on improving the quality, not only the quantity of reporting through training, greater engagement with the Chinese government which is critical, and support for inclusion of ESG data alongside financial disclosures. I didn't catch the start of Sean's talk so I dont know if he referred to the potential of reporting in China, but given the rapid pace of reporting development in that country, I was thinking of taking a course in Chinese, as many of the ones I have seen are not in English. However, there are some in my native tongue. Sean mentioned Cosco, a large Chinese shipping business, whose 196 page 2008 Sustainable Development Report , at GRI level A+, is downloadable from their website and can even be viewed in video edition. This does seem like a very comprehensive report. The Company has been reporting since 2005. The other noteworthy reporter mentioned was China Mobile Ltd, whose 2009 report can be downloaded here. It is also an impressive report, their fourth, called "Growing Together Harmoniously". The Company has over 500 million customers, and includes a feedback form built into their report, which is a nice touch, apropos encouraging engagement. I just hope they dont get 500 million completed forms back, as by the time they analyse the feedback, it will be 2025 before we see their next report. Both Companies participate in the UN Global Compact and report on their adherence to the principles. Thanks to Sean and the GRI for a fascinating session! I came accross this headline: Singapore firm eyes profit in cheap toilet market. The idea is to produce cheap state-of-the-art fertilizer-making toilets which can be supplied to the world's poorest for only $30, thereby improving world sanitation and a global health problem. According to the article, there is a market of around 2.5 billion people who lack functioning toilets and must resort to using the big outdoors to do their stuff. I hope this innovative Singapore firm has enough production capacity to supply this enormous market. The interesting environmental aspect of these cheapo loos is the fact that they separate solid and liquid waste, thereby enabling the solid waste to be used for fertilizer. Just imagine millions of tons of potatoes, wheat, corn, rice and beans fertilised using human excrement. Actually, this is not new. Biosolids has been a subject of contention for some time, as shown in this article written way back in 2000, which points to the dangers of using human waste as fertilizer. We are committed to a sustainable planet and protecting our environment whilst making use of natural bodily functions. 2010 has been another successul year in low-cost toilet production. We have reclaimed 21,000 square kilometers of the Singapore Strait and turned it into a major toilet plant, employing some 18,000 workers. Fortunately, we did not need to install bathrooms as the quality inspection checks can be performed by workers from the different production lines, whenever they feel a biological need. Not only this, the waste produced during these quality inspection checks is used to fertilize our own vegetable garden, thereby producing a renewable source of organic food for the workers to eat during their lunchbreaks. In this way, we have developed the first closed loop production system where not an ounce of waste is unexploited. Sales of our toilets has gone well in underdeveloped countries who now can supply plantations and agricultural farms with no-cost fertilizer. This has resulted in higher crap productivity and higher crop productivity, as everyone wants a piece of this sustainable action. In addition, we have developed an Employee Volunteer program whereby our employees demonstrate using our products in low-income communities whose populations are experiencing a change in personal hygiene habits for the first time. This has been very successful, with some employees being called back to demonstrate again and again. The outcome of our efforts to date has been a significant improvement in world health, global sanitation, and major advancements in toddler toilet-training, which now begins at the age of 3 months. In fact, our product innovation pipeline contains a toddler toilet for low-concentration fertilizer production. Our most significant material issue has now become maintaining a steady supply of food to provide input for the people who need to maintain a steady supply of output . Is your guitar sustainable ? If not, good news is afoot. Maybe. By now, you should be able to buy a sustainable guitar from a new business who will manufacture them in accordance with environmental principles and respect for forest cultures. The wood used in the guitars is reported to be FSC Certified and a portion of the profits are to go to conserving Rainforests. This green guitar Company was founded in 2006 and planned to begin production in 2008.The workforce of 167 people (within two years) has not been employed yet. The Company, at the time of writing it's first Sustainability Report, had not closed any deals, but notes that some of the most famous guitar brands in the world had shown interest. I could find absolutely nothing in an extensive websearch to suggest that this Company is actually making sustainable guitars today. But here's the thing: a document, which masquerades as a first Sustainability Report - the 2006/2007 Sustainability Report for the Hering Madeiras e Instumentos Musicais da Amazonas. There are a few amazing things about this document. First, the fact that it calls itself a Sustainability Report is quite unfathomable. The similarity between a few pages of general blurb and a Sustainability Report is aspirational at best, completely misleading at worst. It's like calling Jack the Ripper a ladies man. Or calling Beano the comic a Shakespearean masterpiece. Second, this pseudo Sustainability Report is about a business which hasn't done any business. It was written covering two years BEFORE the Company was to go into production, as a guitar-making start-up with a plan to manufacture and sell in a sustainable way. In fact, the report looks more like a business plan than any form of report on the actual sustainability of an actual business. I am all for a sustainable mindset, and I just love optimists, but frankly, how can you have a Sustainability Report for a business which has not proven it can sell anything, let alone do it sustainably? Third, this report appears in the finalists for the GRI Readers Choice Reporting Awards 2010. This no-business -no-report includes a GRI Index .. well, of sorts - it's a table of a small selection of GRI clauses and indicators against which are noted some section headings contained in the document and which do not even actually correspond to the information required. So how come this "report" found its way into the GRI Reporting Awards, and how come it became a finalist, alongside vanguard reporters such as 3M, Adidas, Coca Cola, Starbucks, Tata, Titan, P&G, Pfizer, Microsoft, Macdonalds, Intel..... how on earth did Hering (potential) Guitars Instumentos etc join this party? The point of all of this is to state the obvious. A Sustainability Report is the reflection of sustainable business. The definition of a business is that you sell something. Or did i get that wrong ? If so, at the point of writing their report, this Company was not a business, their Sustainability Report cannot be a sustainability report. It's a nice marketing brochure. It's a possible business plan. It demonstrates some laudable intention. But it should not be a finalist in a serious Sustainability Reporting Awards program. But then again, if it has got that far, you never know, it just might win the Best Report Award. Now, wouldn't that be interesting?